The five defendants who were tried for attempting to extort £4.25m from the owner of this painting, Madonna of the Yarnwinder, attributed to Leonardo da Vinci have been cleared in Edinburgh. Three defendants were found not guilty, while the other two received not proven verdicts. Not proven is a Scots law verdict, essentially just as good as not guilty, but allows a jury to acknowledge they thought a defendant committed wrongdoing, though not enough to prove the offence. My initial response: I think this was a terrible verdict, though I didn’t get the benefit of hearing the whole trial. Based on published reports, these defendants made it easier for an art thief to profit off a theft, and are just as culpable as the men who stole the work. The jury at the high court in Edinburgh decided today that the prosecution had failed to prove that the three solicitors and two private detectives were guilty of a complex conspiracy targeting the Duke of Buccleuch, one of the country’s most senior peers. The five were accused of threatening to destroy Madonna of the Yarnwinder, a Da Vinci painting that was insured for £15m but unofficially valued at £30m to £50m – unless the duke paid them £4.25m for its return. The jury said the charges against Marshall Ronald, 53, a solicitor from Skelmersdale, Lancashire, and Robert Graham, 57, a private detective from Ormskirk, Lancashire, were not proven – the Scottish verdict that stops short of declaring someone not guilty. After deliberating for two days the jury also decided that Graham’s partner, John Doyle, 61, also from Ormskirk, and two senior commercial lawyers from Scotland, Calum Jones, 45, from Kilmacolm, Renfrewshire, and David Boyce, 63, from Airdrie, Lanarkshire, were not guilty of the charges. Doyle, Graham and Ronald were jubilant. They insisted they had been honestly trying to broker the return of the 500-year-old painting – one of only two Da Vinci paintings in private hands – in return for what they believed was a fair reward. They accused two undercover police officers who posed as the duke’s agents of deliberately conning them into believing their offer had been accepted. The prosecution alleged that all five men were guilty of an elaborate extortion attempt: they had repeatedly refused to alert the police that they knew how to recover the stolen painting, and had threatened that “volatile” individuals would destroy the Da Vinci unless their ransom demands were met. Background on the recovery of the work here. Severin Carrell, Five cleared of trying to extort £4.25m from duke for return of stolen Leonardo painting, The Guardian, April 21, 2010. Leonardo da Vinci’s Madonna with the Yarnwinder has been put on display at the National Gallery of Scotland in Edinburgh. The work was stolen in 2003 from the Duke of Buccleuch’s home at Drumlanrig Castle in Scotland. The work was recovered in 2007, and eight men (including some once-prominent solicitors) are facing criminal trial for their involvement in the theft. It is a rare good outcome for an art theft like this. Stolen da Vinci back on display, BBC, December 17, 2009. The AP is reporting that a $200,000 reward has been offered for help in recovering 12 works of art stolen on August 23rd in the San Fernando Valley in California. Two of the works, Peasants by Marc Chagall and Alicia Alanova by Kees van Dongen are pictured here. The works were insured, though that has potential drawbacks for the owners if the works are ever recovered. Selling these works on the open market or at an auction house any time soon will be very difficult. As I’ve speculated before, there are four potential reasons why thieves may steal well known works of art. The first, is that a wealthy collector admires the works, and hired a thief. This is often referred to as the Dr. No situation. This seems the least likely possibility, but the one that strikes a chord with the imagination. Writers and journalists frequently cite Dr. No as being responsible for thefts, and I admit it makes for good Bond villains, but there has been little convincing evidence that this is why people are stealing rare objects. Second, the thief may not have known that the object was so rare as to make its subsequent sale difficult. Third, the thief may simply be trying to kidnap the object. They could then insure its safe return for a generous reward. This is what the defendants in Glasgow are charged with in the theft of da Vinci’s Madonna with the Yarnwinder. Finally, perhaps there is a market somewhere for these works. Perhaps it may not be all that difficult to sell these kind of works. This strikes me as the most troubling possibility, as these valuable stolen works will likely be widely-publicized and photographs will be circulated. The men are accused of contacting a loss adjuster, whom they believed to be acting for the insurers of the painting, and stating that they could return the artwork within 72 hours. It is alleged they said the masterpiece would not be returned unless £2m was deposited in an account at Marshall Solicitors, formerly known as Marshall Gilby Solicitors, and a further £2.25m placed in a Swiss bank account. I have recently come across some very interesting excerpts from Scottish Parliamentary Questions and Answers. Now, these are seldom mistaken for serious policy debate, but these reveal some shortcomings in current policy. There exists a serious gap from what Alex Salmond and the Scottish National Party are saying about repatriation, and what they are actually doing. First, with respect to “tainted cultural objects”, the Scottish Labour Party’s Shadow Minister for Culture asks what Scotland is doing to ensure stolen or looted objects aren’t bought and sold in Scotland. The answer, it seems, is not much. will assist ministers in determining how best to proceed. It seems Scotland are still waiting to act, but it would be regrettable indeed if they made the same mistakes that were made by their neighbors down south. The Dealing in Cultural Objects (Offences) Act 2003, in force in England and Wales, is not a criminal offence which will likely have any kind of measurable impact on the illicit trade, as I’ve argued here. The evidentiary hurdles are simply too great given the current state of the art and antiquities trade. One hopes that MSP’s don’t wait until another high-profile theft or sale takes place before they act. One would have thought the arrests following the recovery of da Vinci’s Madonna of the Yarnwinder would have at least eliminated the argument that this is not a problem, and nothing needs to be done. transfer objects from their collection. Alex Salmond has been arguing for a return of the Lewis Chessmen for over a decade now. Is that the best cultural policy his government can come up with? They will simple leave it to individual Boards of Trustees. I’ll ask again, what is the cultural or historical imperative which dictates the chessmen should be taken from the British Museum, and returned? And if so, does this mean other treasures such as the St. Ninian’s Isle treasure should be returned to Shetland? On the one hand Salmond argues against this perceived injustice which led to the current location of the Lewis Chessmen (even though they are Norwegian), but he makes no corresponding changes in Scotland for objects in its collections, which may have been taken under far more questionable circumstances. Apologies for the light posting the last couple of weeks. I’ve returned from the US and the AALS hiring conference. It seemed to go well, and I was pleased with the response I got from the handful of interviews I had. I am cautiously optimistic about my chances of further interest from the schools I spoke with, but I’m also glad to be back here so I can concentrate on finishing up my thesis. This Morning’s news that a private investigator has been charged in the theft and recovery of da Vinci’s Madonna of the Yarnwinder. That brings the total to five now. Iran’s Cultural Heritage News Agency reports on last Thursday’s auction of the Achaeminid limestone relief from the city of Persepolis, in present-day Iran. It’s a slanted view of the dispute, which ignores Iran’s difficult legal footing. But the unpleasant outcome is the acquisition by an anonymous buyer for $1.2 million USD. Three paintings worth an estimated $100,000 were stolen from a San Antonio gallery on Sunday. Germany has finally returned 100 objects to Greece, many of which date back 8,000 years. The objects were stolen in 1985, and recovered in a raid last year. They were seemingly forgotten until a German court ruled in August that they should be returned. A number of news outlets have coverage of the antiquities playing cards now issued to US soldiers in the middle east, urging them to take care of the archaeological heritage there. And most importantly, Princeton has reached a repatriation agreement with Italy. The deal is similar to those reached with the Getty, the Met, and the MFA Boston. TRENTON, N.J. (AP) — A truck driver who stole an art masterpiece from an unattended transport truck, then claimed he found it in his basement was charged with theft, authorities said. Steven Lee Olson, 49, was charged with stealing “Children with a Cart,” a 1778 painting by famed Spanish artist Francisco de Goya, federal prosecutors said Wednesday. The painting was insured at a value of about $1 million. In an initial appearance in federal court in Newark on Wednesday, Olson through his lawyer decided not to immediately contest his detainment. A bail hearing was scheduled for Oct. 31. The federal public defender representing Olson didn’t immediately return a phone message. A message left at a number listed for Olson also wasn’t immediately returned. The painting was being trucked to the Solomon R. Guggenheim Museum in New York City from Ohio’s Toledo Museum of Art last November. It was stolen as the transport drivers spent the night at a Pennsylvania motel. They discovered it missing the next morning. Within days, Olson contacted federal authorities through an attorney to say he found the painting in his basement, said U.S Attorney’s office spokesman Michael Drewniak. After a lengthy investigation, authorities determined that Olson, a self-employed truck driver, had lifted the piece himself, Drewniak said. “It was a crime of opportunity that didn’t pay,” FBI agent Sandra Carroll said. I’m traveling to Washington D.C. today so I don’t have time to post much substantive thought on this, but I am struck by how much more coverage this charge and arrest has received here in the US than the recovery and and subsequent arrests arising from the recovery of da Vinci’s Madonna of the Yarnwinder a few weeks ago in a Glasgow law firm’s offices. "A Silly Thing to Steal"
So said my cab driver on the way down to the BBC’s Aberdeen studios bright and early this morning to talk about the recovery of the Da Vinci yesterday. A stream of the interview is available here. I’m not sure I was able to offer much more insight. Details on this recovery are still sketchy. The FBI estimates the size of the illicit trade in art and antiquities at $6 billion, which is quite a sum. A better estimate may be the idea put forth by Simon Houpt in the excellent Museum of the Missing that if we were able to collect all the stolen works in one single museum, it would be the world’s greatest by a good measure. Why then was the work stolen? This question will surely be answered in the coming months, but there are three reasons usually given. First it may have been a theft to order. This seems the least likely. If you have a masterpiece you want to show it off and put it on display. Second, the thieves may have been unaware how hard this kind of work might have been to sell. Finally, and most likely I think is the thieves may have wanted to ransom the work back to the Duke of Buccleuch or to the insurance company. This is just idle speculation, but I wonder if the passing of the Duke last month may have encouraged the thieves to think they could dispose of the work. In any event this is a fantastic recovery. Police recovered the work yesterday from the law offices of HBJ Gateley Wareing; and arrested a partner in the firm and three other men. At this point there are far more questions than answers. An interesting issue may be whether the lawyer committed any wrongdoing, or if he in fact alerted the authorities to the location of the work. I’ll confess to a total ignorance of the professional rules of conduct for lawyers in Scotland, but I would venture a guess that assisting a client in committing a crime is frowned upon. Various news reports have speculated that the lawyer may have been assisting in repatriation, or looking at how to draft a contract under Scots law to allow the return of the painting. There are other initial questions I have. For starters has the work been damaged? Will the work return to Drumlanrig Castle? What is the insurance agreement regarding the work? If an insurance policy has been paid out, the insurer now may have title to the work, but the Duke’s estate may be able to trade the money paid for the work, depending on the agreement. The four men will appear at Dumfries Sheriff Court this morning, so more details should be forthcoming this afternoon. Author Derek FinchamPosted on October 5, 2007 Categories AntiquitiesTags Arrests, Art Theft, in the media, Leonardo Da Vinci, Madonna of the Yarnwinder (recovery), recoveryLeave a comment on "A Silly Thing to Steal"
After four years this work has been recovered. 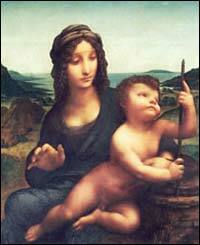 Madonna of the Yarnwinder, a masterpiece by Leonardo Da Vinci was stolen four years ago from Drumlanrig Castle. It was a daring theft, and was listed on the FBI’s top 10 Art Crimes. The BBC has the details of today’s recovery here. Three men were arrested today in Glasgow, apparently after they attempted to sell the work. This was a major theft, and a great recovery. I’ll have a lot more to say on this tomorrow. If everything goes as planned I should have an interview on the Good Morning Scotland program tomorrow morning, and I’ll post a link here when one becomes available. In the meantime congratulations should go to the law enforcement services who recovered the work, led by the “Dumfries and Galloway Police and involved the Scottish Crime and Drug Enforcement Agency (SCDEA), Serious Organised Crime Agency (SOCA) and Strathclyde Police.” Odds are that a work like this only has a 20% chance of recovery within 30 years.